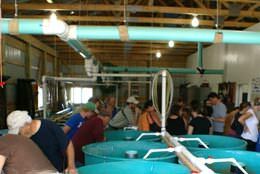 The Department of Natural Resources, Michigan State University, Tower-Kleber Limited Partnership and Sturgeon For Tomorrow will host sturgeon hatchery tours at the Black River facility northwest ofOnaway, Michigan, Saturday, Aug. 25. Tours will run from 10:30 a.m. to 1 p.m.
Tours are free of charge. 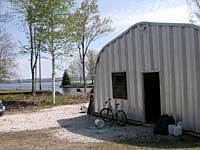 The hatchery is located in Cheboygan County on the Upper Black River adjacent to the Kleber Dam. From M-68 two miles west of Onaway, take Black River Road (F-05) north to Twin School Road, then west a little over 3 miles to the hatchery which is on the north side of the road just before the dam. 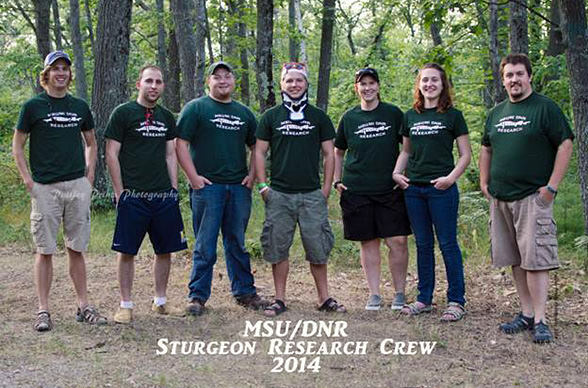 During the tours, researchers from the DNR and MSU will be on hand to talk about lake sturgeon biology, reproductive ecology and the current year's research. Sturgeon for Tomorrow representatives will discuss restoration work to improve sturgeon spawning habitat, sturgeon conservation and outreach programming. 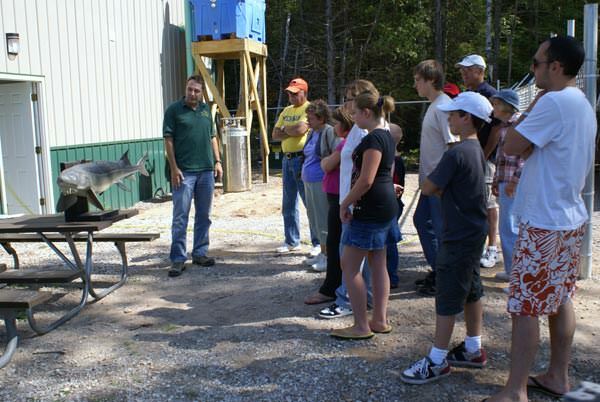 "On the tour visitors will see the 3-month-old lake sturgeon currently in the hatchery, and learn about early life history and how we can all play a role to keep healthy populations of this fish in our waters," said Dave Borgeson, Northern Lake Huron Unit supervisor with the DNR. 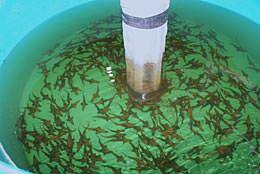 The streamside rearing facility is an important component of lake sturgeon rehabilitation efforts in the Cheboygan River watershed. The facility conducts research to increase our understanding of lake sturgeon, thanks to DNR, federal, Great Lakes Fishery Trust and Sturgeon for Tomorrow funds. Results provide much-needed guidance for managers involved in lake sturgeon recovery efforts, while improving the effectiveness of lake sturgeon culture and stocking efforts. 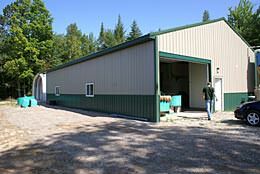 The sturgeon fingerlings reared at the hatchery are scheduled to be released into the Black River and Mullett Lake Aug. 25 after the tours conclude. For more information on lake sturgeon and to learn how to become involved in their rehabilitation efforts, visit www.michigan.gov/sturgeon or www.glsturgeon.fw.msu.edu. On August 23rd Black Lake was stocked with 500 juvenile lake sturgeon. All sturgeon stocked into Black Lake were tagged with PIT tags. On that same day, 478 were additionally stocked into Mullett Lake. 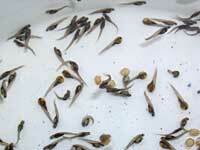 Additionally, another 232 juvenile lake sturgeon were stocked into Mullett Lake on September 25th. For an ongoing research project, 300 juvenile lake sturgeon were stocked into both Tower Reservoir and Kleber Reservoir, as well as 54 age 1 sturgeon to each reservoir. We would like to thank all of you for your assistance on the river and your support during the off-season. MSU Team; Nick Gezon, Jared Militello, Charles Wlasniewski, Kyle James Broadway, Lindsey Adams, Brittany Woodward and Nathan Barton. August 23, 2014: Sunrise Communications video taped sturgeon hatchery tours and releases. The streamside rearing facility/sturgeon hatchery is an important component of lake sturgeon rehabilitation efforts in the Cheboygan River watershed. These efforts involve the Black Lake Chapter of Sturgeon for Tomorrow, the Department of Natural Resources, Michigan State University and Tower-Kleber Limited Partnership. The facility conducts research to determine growth and survival of lake sturgeon, thanks to DNR, federal, Great Lakes Fishery Trust and Sturgeon for Tomorrow funds. Results provide much-needed guidance for managers involved in lake sturgeon recovery efforts, while improving the effectiveness of lake sturgeon culture and stocking efforts. "Many of these stocking efforts were public events that shined a spotlight on how important lake sturgeon are to our state, "said DNR Fisheries Division Chief, Jim Dexter. "Michigan has a long history with the lake sturgeon and working with our partners helps us to move forward toward protecting them for the future." 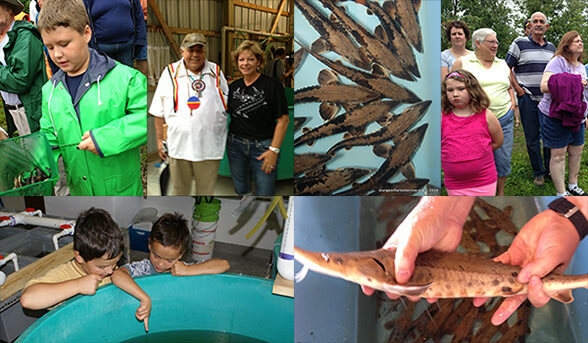 The Little Traverse Bay Band of Odawa Indians (LTBB) also reared and released 677 Black Lake sturgeon fingerlings into the Sturgeon River (Burt Lake) on August 28, 2014. The Michigan Department of Natural Resources and Environment, Tower-Kleber Limited Partnership, Michigan State University and Sturgeon for Tomorrow celebrated the release of 1,700 young sturgeon raised at the Black River Streamside Lake Sturgeon Rearing Facility on Saturday, August 15, 2009. "The efforts of the people at Tower-Kleber have been extraordinary; they worked through difficult weather conditions and under a very tight schedule to construct the facility in time to produce sturgeon this year," said Dave Borgeson, the Northern Lake Huron Unit manager for the DNR. Sturgeon For Tomorrow with the assistance of the Burt Lake Preservation Association and the Mullett Area Preservation Society contributed $ 5,300.00 to feed the young sturgeon. "Sturgeon for Tomorrow stepped up huge for us this year by purchasing the food needed to raise this batch of fish," said Dr. Kurt Newman, (former) Lake Huron coordinator for the DNR. "We're just ecstatic about the new rearing facility," said Brenda Archambo, SFT president. "It will allow us to continue our efforts to restore the sturgeon population, as well as offer a great opportunity for public outreach and education." The rearing facility was staffed by MSU personnel, led by Dr. Kim Scribner, Ph.D. candidate Ben Rook of MSU, and DNR researcher Dr. Ed Baker. 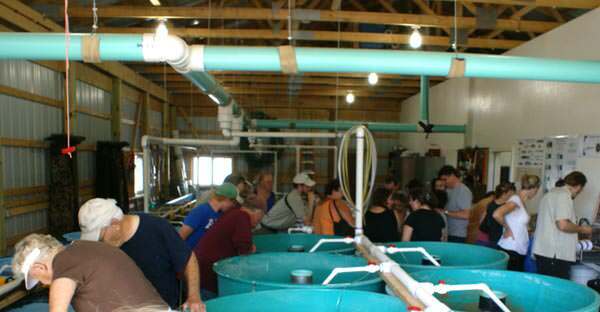 Tours of the new streamside rearing facility-sturgeon hatchery on the Upper Black River were well attended. Nearly 250 visitors from around the globe viewed three month old sturgeon in the hatchery, and learned about early life history and how we can all play a role to keep this fish in our lakes. Sturgeon researchers from the DNR and MSU were on hand and talked about lake sturgeon biology, reproductive ecology and current year’s research. Sturgeon for Tomorrow representatives discussed restoration work to improve sturgeon spawning habitat, sturgeon conservation and outreach programming. Aug. 15, 2009 - The Department of Natural Resources, Michigan State University, Sturgeon for Tomorrow and the Tower-Kleber Limited Partnership are celebrating the release of young sturgeon raised at the Black River Streamside Lake Sturgeon Rearing Facility. 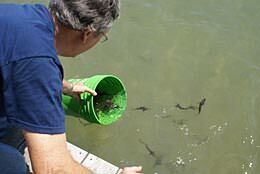 DNR Fisheries Division officials today announced that the newly completed streamside sturgeon rearing facility on the Black River has produced its first batch of young lake sturgeon, and these fish are now ready to be released back into the river. 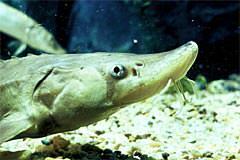 This is part of ongoing efforts to rehabilitate the Black Lake sturgeon population. A ceremony to celebrate the successful construction of the facility and the stocking of the young lake sturgeon will be held at 11 a.m. Saturday, Aug. 15, at Kleber Dam, which is operated by Tower-Kleber Limited Partnership. The dam is located at the Twin School Road crossing of the Black River, approximately three miles northeast of Tower in Cheboygan County. Construction of the rearing facility was one of the essential elements included in a negotiated agreement between the DNR and Tower-Kleber as part of the dam's operating license. The company agreed to help enhance sturgeon populations after a 1997 DNR survey showed sturgeon numbers had declined significantly from previous levels. Sturgeon rehabilitation efforts have attracted a number of partners, including Sturgeon for Tomorrow (SFT), a nonprofit group dedicated to the future of lake sturgeon. Members of SFT's Black Lake Chapter have volunteered thousands of hours to "Sturgeon Watch," an effort to protect vulnerable adult sturgeon during the spawning run, and have contributed thousands of dollars for habitat protection and sturgeon research efforts. "Sturgeon for Tomorrow stepped up huge for us this year by purchasing the food needed to raise this batch of fish," said Dr. Kurt Newman, Lake Huron coordinator for the DNR. The rearing facility was staffed by MSU personnel, but that was only one of the many tasks completed as part of the ongoing research, led by Dr. Kim Scribner, Ph.D. candidate Ben Rook of MSU, and DNR researcher Dr. Ed Baker. "It has been a very busy field season. The timing for the spring tagging of spawning adults, collection of eggs and larval sturgeon, and rearing of the young fish all overlapped this year, which made for some very long days," Rook said. 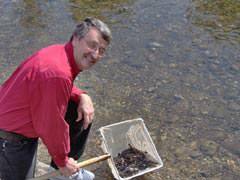 "It will be nice to see our efforts pay off when we put these young fish back into river." A groundbreaking ceremony to begin construction of the streamside rearing facility was held July 2, 2008 at Kleber Dam, which is operated by Tower Kleber Limited Partnership. The dam is located at the Twin School Road crossing of the Black River, approximately three miles northeast of Tower, in Cheboygan County. "We're ecstatic about this new rearing facility," said Brenda Archambo, SFT president. "It will allow us to continue our efforts to restore the sturgeon population, as well as offer a great opportunity for public outreach and education." Researchers from Michigan State University, DNR, and volunteers studying sturgeons’ reproductive ecology, early life history, recruitment and past stream-side rearing have aided the process by which this facility has developed. "When this facility begins operations next spring, it will enable the DNR and our partners to continue the rehabilitation and research efforts for the Black Lake sturgeon population," said DNR Fisheries Biologist Dave Borgeson. "With the high level of commitment we're seeing from all the partners, we believe the future will be much brighter for Black Lake sturgeon." Successful operation of an experimental temporary streamside rearing station led to the establishment of this permanent facility, which has resulted in more than 27,000 juvenile lake sturgeon being stocked into the Cheboygan River watershed. We are planning a ribbon cutting ceremony in the spring of 2009 at which time we will put a time capsule in the hatchery. We will plan an event in 20 years to reveal it’s contents. If you would like to contribute a small artifact or picture to the capsule, please contact any board member. The contents of the capsule are only limited by your imagination! A time capsule is a historic collection of goods and/or information, usually intended as a method of communication with people in the future. The time capsule is a fantastic opportunity for all generations to contribute and share memories and leave a legacy for future generations. In 1994, the DNR entered into a settlement agreement with the Tower-Kleber hydro-project owners through the Federal Energy Regulatory Commission (FERC) licensing process. Among many things, this agreement contained a clause that stated, “…if a rearing facility is necessary for the sturgeon propagation activities of the MDNR, the utility will work with MDNR in constructing the rearing facility. Since that time, the MDNR Fisheries Division has invested more than $2 million in research and monitoring to investigate the appropriate ways to go about sturgeon rehabilitation. 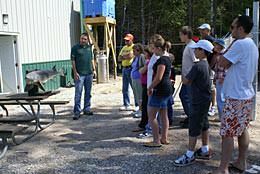 Over the past couple of years after careful review of the current scientific information, Fisheries Division realized the time was right to develop this sturgeon rearing facility to rehabilitate sturgeon in the Black River system, starting with Black Lake. We have learned much from ongoing research about streamside rearing and are ready to move beyond a research-only phase and into a rehabilitation phase for lake sturgeon. We are pleased to announce that the resource agencies, MDNR, MDEQ, and the U.S. Fish and Wildlife Service along with the Tower Kleber Limited Partnership have an agreement in principle for this facility and that the Tower-Kleber Limited Partnership will be investing in the building of this facility in the coming year. The formal FERC process will require filing of the appropriate paperwork and plans in November or December 2007. FERC will then need time to review the specific plans and provide comments back to the agencies and Tower- Kleber Limited Partnership for a finalized agreement for signing. The primary purpose of the facility will be to raise young sturgeon for the purposes of rehabilitation. The facility will consist of two buildings, one for incubation and rearing of the juvenile sturgeon and one for outdoor rearing to stocking size. The outdoor facility will be the facility that was previously located downstream. Unlike other fish, sturgeon require a lot of “floor” space and thus we need a larger area to raise these fish compared to other fish. 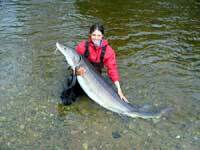 The production target will be about 3,300 young sturgeon per year. This annual number is based on a projected number of 65,000 fish stocked over 20 years to achieve a desired level of 2,000 adult sturgeon in Black Lake. This produces a density similar to that of Lake Winnebago in Wisconsin. In addition to the rehabilitation program, the facility will provide a platform for continued research to help us better understand the limitations to sturgeon production and survival and to help us continue improving our management and rehabilitation programs for sturgeon statewide. Timeline: the facility should be up and running by fall 2008, and ready to receive the first round of youngsters in spring 2009. The agreement for the facility will be in place through the life of the current license which expires in 2024. The above information was submitted by Tammy Newcomb, Ph.D., Lake Huron Basin Coordinator, Michigan DNR Fisheries Division. SFT anticipates providing outreach, education, perhaps in the form of an interpretive center, and any and all other means necessary and proper to assure management of this facility produces the sustainability in the resource. We would also like the thank Gil and Brenda Archambo for the use of their river property that supported the past three years of rearing. Thanks to the extremely large number of spawning adults in this year's spawning run we were successful in obtaining eggs from 12 females and milt from the majority of males. 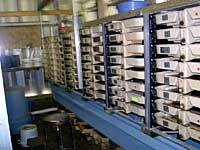 Like 2005, eggs were incubated at both our streamside hatchery and at Wolf Lake State Hatchery to identify differences in hatching times and survival between these two rearing environments. We produced a total of 21 different family groups. Time to hatch was approximately 1 week at the stream side hatchery and a little longer at Wolf Lake due to cooler water temperatures. Fungal infection was not a major issue for the first few batches of eggs however eggs fertilized later in the spawning season were subject to higher fungal rates because of rapidly warming waters. The stream-side hatchery has run smooth. Early this spring we made improvements to our incubation system in an effort to further remove fine particulates from the incoming river water. This was done to reduce fungal infection, sedimentation build up, and overall stress on the eggs. 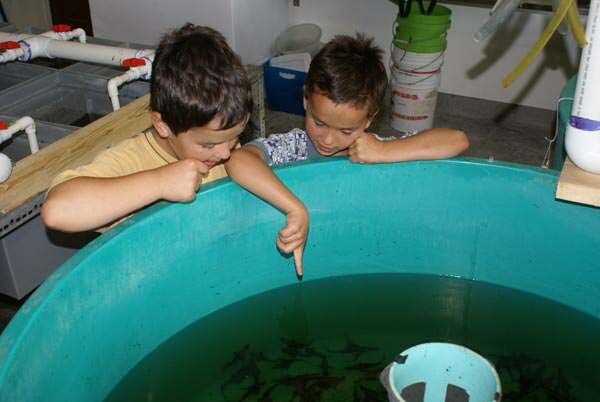 We installed a large number of small 1 gallon rearing tanks to serve as holding tanks after the fish had hatched from the incubation trays and to use for experimentation purposes. With the addition of the small rearing tanks we were able to examine some interesting questions we had concerning larval lake sturgeon development. We were particularly interested in how larval sturgeon utilize their yolk-sac reserves after they have hatched. We subjected different family groups of larval lake sturgeon at hatch to 4 different environments. The four environments were an open tank, a tank with cover so the larvae could seek refuge, an open tank with food, and a tank with cover and food. We removed fish every 2 days from each tank and took pictures of them. This provided us with a measurement of how they grew and utilized their yolk-sac reserves over time given differences in refuge and resource availability. We are also pleased to report that the lake sturgeon were also very successful in reproducing this year as indicated by large number of larval fish that we captured drifting downstream from the spawning sites over a month of sampling (7,434). As in previous years, we deployed drift nets at the same location on the Upper Black River (Site D3) throughout the entire larval sampling season. Within this location, five drift nets were deployed approximately two meters apart in a straight line along a transect across the stream channel. 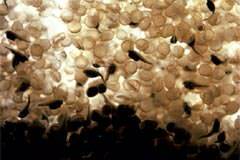 Majority of the larval fish were captured during several "peak" hours of drifting activity between the hours of 11:00 pm and 1:00 am. The day following the Sturgeon For Tomorrow Banquet turned out to be a frenzy with several dozen expectant onlookers watching over the 3,600 five month-old sturgeon fingerlings being released into Mullett and Burt lakes. 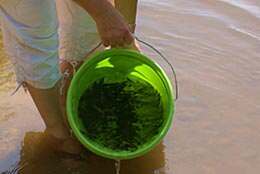 Another 4,200 were released in the Upper Black River on September 18. 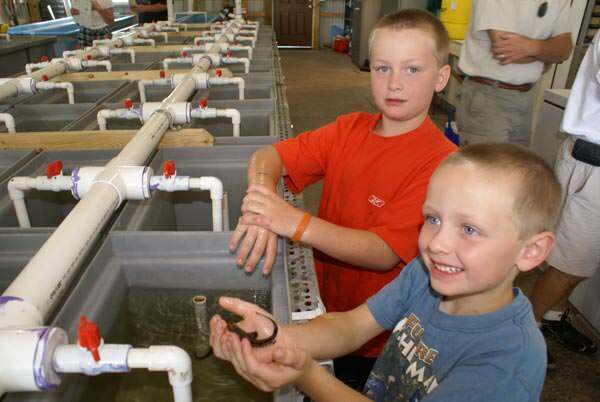 Five-Thousand were reared in the streamside research facility on the Upper Black River, and 3,600 were raised at Wolf Lake State Fish Hatchery. Patrick Forsythe and James Crossman, MSU graduate students were project managers at the streamside rearing facility. Christin Davis and Jon Bivens assisted in the day-to-day operations. Kelly Smith, the chief of DNR fisheries in Lansing, said he thinks the relationship between the DNR and Sturgeon For Tomorrow is vital to bolstering the dwindling sturgeon population in Michigan. "This partnership between Sturgeon For Tomorrow and the DNR in protecting and rehabilitating the sturgeon population is important to the state," Smith said at the Annual banquet. "It fits in with the rehabilitation efforts statewide." He said the partnership, including the sturgeon guards who patrol the rivers during the spring spawning season to prevent poaching, is unique to Michigan. "There is an effort to study and rehabilitate the population around the state, and it is done in ways we don't see in other states," he said. Sturgeon For Tomorrow President Brenda Archambo said, "We are thrilled to see these unique fish returning to their natal stream." "We don't want to raise sturgeon and simply turn them loose without having an effective monitoring program in place to evaluate and steadily improve our techniques," she says, "especially since our goal is to re-establish a self-sustaining population." We captured naturally drifting larvae, collected/ mixed eggs and milt, and used cultured eggs from the stream then nurtured them for five months within the protected environment of a hatchery (here and Wolf Lake). This greatly increased their survival rate without compromising the genetic diversity of the population." "We are on a quest to quantify natural recruitment, and we will assess the releases overtime in an attempt to better understand the early life history of this majestic creature." The 2005 field season started off with a bang, that bang resulting from a 40 foot long steel building hitting the ground in early April. For the next month we became more engineers than biologists. It is amazing how such a project came together so quickly. With the help of Sturgeon For Tomorrow and a number of local residents we had the building constructed within 4 days of its arrival. Then came the pumps, tanks, and associated plumbing which would not have come together without the assistance of the Oden fish hatchery who supplied us with numerous man hours and tools. We can not express our gratitude enough to all those involved with getting this facility up and running. When we finally got back to being biologists we had some great success and have learned a lot over the course of the summer. This year's weather cooperated very well and with the low water levels we had access to handle a very high proportion of this years spawning run. We took eggs from 14 females and to no ones surprise had no problem collecting milt from multiple males. 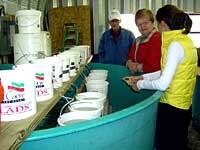 Eggs were brought back to the stream side hatchery fertilized and incubated in heath trays. This resulted in offspring that hatched from 27 different families. We also transported half of the eggs down to the Wolf Lake State hatchery were they were incubated and are currently being raised. We learned a lot about incubating sturgeon eggs this year and have come up with the ultimate formula for a successful hatch. Just the right mix of AAA batteries for your head lamp, mixed with some elbow grease, patience, and 18 hours a day sorting and removing dead eggs or ones with fungus does wonders for a successful hatch. Lucky for us the eggs hatched within a week. Artificial spawning was one of three collection methods we used this year. We also collected eggs from the water column and substrate that were fertilized naturally and incubated those at the stream side hatchery. 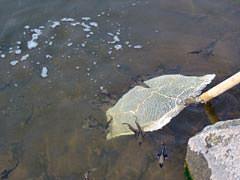 The third collection method consisted of collecting larvae dispersing downstream from the spawning sites. Each of these collection methods are separated within our tanks so that we can follow differences in growth and survival. It has been interesting to observe the differences between families. Some grow well in high numbers while others don't. Some families are all the same size while others have big guys, medium guys and some runts. To date the fish in the hatchery range from 2 inches to just over 5 inches. On July 20th we released the first batch of fish just above spawning site B. There were approximately 4000 in total, half from Wolf Lake and half from our stream side hatchery. Each fish was distinctly marked with a florescent tag on their upper back so when re-captured we could identify the collection method it originated from as well as the location where it was reared. Preliminary data shows the stream side fish moving further downstream faster however once the fish started to settle out we had a hard time finding them. The next release will be August 16th. Over the next few years we hope to identify the most appropriate age at which to release juvenile lake sturgeon. We will also be holding a number of fish from both Wolf Lake and Black Lake until late fall when they are big enough to receive acoustic transmitters. We will use these transmitters to look at differences in movements between the fish reared downstate and the fish reared in the natal water. In closing we would like to once again thank all the help we have received this summer. Sturgeon for Tomorrow, the DNR, and the local residents have made for a fantastic and eventful summer.